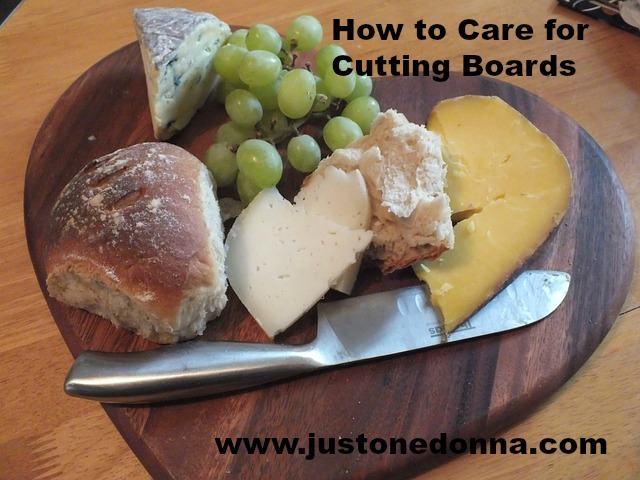 Do you use wooden cutting boards in your kitchen? Wooden cutting boards are a beautiful thing. Properly cared for, a wooden cutting board lasts for years and years. Through many years of ownership, your board will develop deep character and patina, just like you. It will be a cherished addition to your kitchen. Use your board every day to protect your kitchen counters. Your wooden board will also make an excellent serving tray or an attractive base for an appetizer cheese tray. 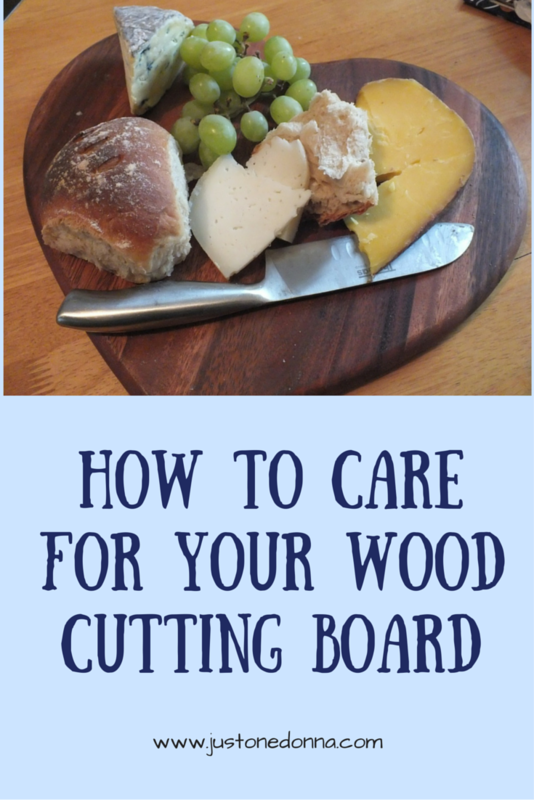 Proper care of your wooden cutting board begins when you bring it home. Before you use the board, you will want to apply its first coat of food-safe mineral oil. I usually get my mineral oil at my local drugstore. You don't want to use vegetable oil or olive oil. Both can turn rancid. The video below shows you my tip for applying mineral oil to your wooden cutting boards. A properly oiled cutting board is a pleasure to use and easy to clean. Oil daily for the first week. Oil weekly for the next month. Oil monthly for the rest of the board's life. You should never do a few things with your wooden cutting boards. Never put your wooden cutting board in the dishwasher. Never let your wooden cutting board soak in water. Never put your wooden cutting board away wet. The theme from the "Nevers" is to minimize your cutting board's exposure to water. Wipe your board after each use with soapy water and a soft cloth or sponge. Rinse well and wipe dry. Allow your board to dry completely before storing. Occasionally, you may want to disinfect your cutting board with a mixture of vinegar and water. Mix one part white vinegar with five parts water. Wipe the board with the mixture using a soft cloth and allow the board to dry completely before putting it away. 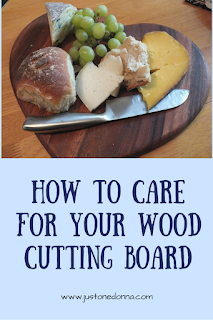 A well cared-for wood cutting board will last you a lifetime. I occasionally clean my boards by rubbing coarse salt into the board with the cut half of a lemon. It's a great way to remove stains from your cutting boards. Hi, Lydia. This is a great tip for cutting board stains. Thanks! This is very interesting Donna. I have never oiled my boards, so I will start doing that. I love that you use the vinegar to disinfect the board. The Blogger's Pit Stop loves quality posts like this one. Thank you. Kathleen, you'll fall in love with your boards if you follow this oiling routine. They become much easier to clean and look prettier to boot!